Hip Osteoarthritis, Regenerative Therapy, and Stem Cell Therapy. Hip osteoarthritis is a common disorder of aging. It is also referred to generally as arthritis. Previously, osteoarthritis was thought to be a wear and tear phenomenon. Current scientific research reflects osteoarthritis is a wear and tear disorder may have a genetic predisposition and is accelerated by trauma. Research also reflects that surgery will also predispose to accelerated osteoarthritis. This results in trauma combined with surgery is not only synergistically linked to a more escalation of degenerative osteoarthritis; it also increases the risk of the future hip joint replacement surgery. Patients are coming more aware of Regenerative Medicine. Regenerative techniques such as Platelet Rich Plasma and Stem Cell Therapy may modify the severity or repair the underlying joint degeneration seen in hip osteoarthritis. 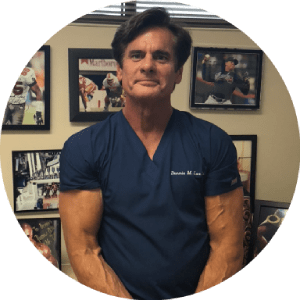 Platelet Rich Plasma and Stem Cell Therapy utilize the patient’s own growth factors and stem cells to assist in healing. The underlying inflammatory process may be impacted by altering cell signaling that continues to propagate the degenerative cascade.